Its open cell foam structure lets it squish flat under traffic with no impediment that a rigid bund will. Made from tough PVC around a length of triangular open cell foam, it can be fixed as a permanent bund. Additional strip of PVC supplied in case Spill Wall is damaged. 90 degree corner pieces also available. The Aluminium Flat Bar is used to hold down the edges of the Spill Wall product and hold the sacrificial covering strip in place. It is required to be drilled and dyna-bolted into place when the Spill Wall is installed. • Bunding high traffic areas. • Install using contact adhesive and aluminium flat bar along each edge. 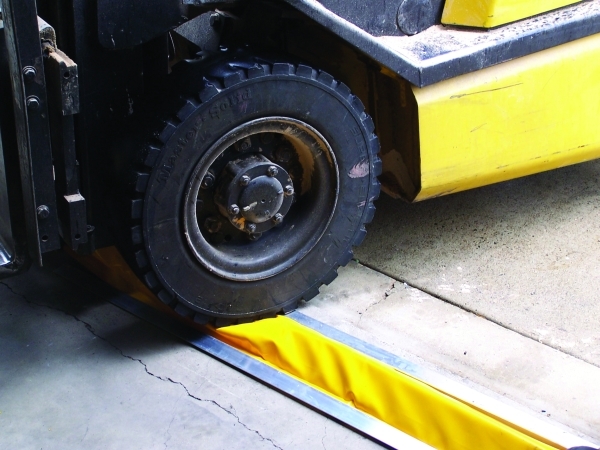 • If traffic sensitivity is not a concern, use the Bund Wall for cost effective installation.